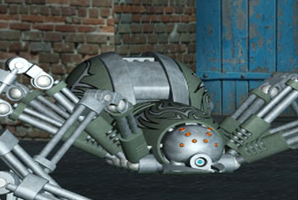 The supervillain Noctrissa uses large mechanical spiders in a variety of her criminal plots. They are APEX-developed machines which are entrusted to her not-so-innocent care. Noctrissa uses the mobile machines in many ways, often serving as bodyguards and enforcers or discreet thieves and robbers. The machines are very durable and strong and are equipped with synthetic web shooters capable of capturing any prey caught in its path and tying them up with its sticky string bindings. They are easily modifiable and many are equipped with stun rays, potent gas, and other forms of attack.